Hatters legend Mick Harford admitted it was an easy decision to accept the offer of remaining in charge of the club until the end of the season on Tuesday. The former player, who was head of recruitment up until just over a month ago, stepped into the breach as interim manager when Nathan Jones left to take over at Stoke City last month. Five league wins and draw later, with Luton now on top of the table, the Town board had seen enough to appoint Harford for the final 14 games of the season. Speaking this afternoon about agreeing to take the role on, Harford said: “It was an easy decision for me, in terms of I’d been in the hot-seat for a few games. “Have I enjoyed it? It’s been tense, it’s been different, because I haven’t done it for years and I keep going back to the players. “The players have made it easy for me in terms of the way they’ve worked and the way they’ve gone about their business. 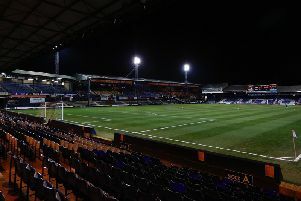 Although most supporters weren’t surprised by the decision to keep Harford in charge, the man himself hadn’t expected it, despite the stunning form Luton have produced during his brief tenure. He continued: “It was a surprise to me. 2020 and the board and Gary (Sweet, chief executive) have decided to concentrate on the bigger picture of what we’re trying to do in terms of getting permission for the new stadium which we’re half-way there with, as we well know. “They perceive that I will be the right person to carry on the job until the end of the season, so I’m very grateful, very honoured. “I guess in terms of where we are and what we’re about, I know the players, I know the squad, I obviously know the football club. “It’s a privilege for me to be in control and be the manager in charge of a football club and what I class is a real good group of players. “It’s a challenge I’m really looking forward to, myself and the staff and it’s something I’m going to embrace and enjoy. Despite Harford claiming 16 points from a possible 18 during his second stint at the helm, including a victory over promotion rivals Portsmouth, he didn’t want any of the glory at his door, preferring to talk up the squad's achievements. He said: “I don’t take any credit for it, I just put it all down to the players. “The way they work, the way they go about their business, they are as I keep saying, a fantastic bunch of players and I’ve got to say it, they are backed up by a magnificent set of of fans who get us over the line at times in all fairness. “They self-manage themselves, they’re a good group, they work hard in training, they have a shape and a system that they enjoy playing. “The players that we’ve brought into the football club in terms of recruitment, we brought them in for that reason, to play a certain style and I’ve just tried to endorse that and encourage them to do that. Harford got the job on his 60th birthday this week and revealed he could have been celebrating his milestone somewhere entirely differently. The boss added: “I was supposed the be somewhere, I had planned to go away because the window had shut, it would give me a break to go away for a few days holiday. “But circumstances change and I was absolutely thrilled and delighted and privileged to be asked to take over the role. “So I’m going to embrace it and going to give it my best shot, as myself and the staff, we’re going to have a real go at it and hopefully get the rewards.